In 1850, Clausius stated that the natural tendency of heat is to flow from high temperature to low temperature.This intuitive and easily verified statement was Clausius’ initial contribution to what would eventually become the second law of thermodynamics. However, in 1854, Clausius set aside this simple statement and sought a rigorous mathematical formulation. The end result was the mathematical formulation of the second law and a new physical property, which in 1865, he would finally come to call entropy. In 1854, Clausius reviewed everybody’s favorite model system at the time: Carnot’s reversible heat engine. Clausius noted that in a heat engine, heat undergoes two mechanisms available to it at the same time: conversion and conduction. Conversion is the process whereby heat is transformed into work or vice versa while conduction is the process whereby heat flows from high temperature to low temperature, or in the opposite direction. For each mechanism, Clausius asserted that there’s a favored and a disfavored direction. Clausius considered the favored direction for conversion to be when heat is produced from work, as in Joule’s experiments where heat results from the work of the falling weight and friction. Therefore, the disfavored direction, according to Clausius, is when heat is consumed to produce work, like in a heat engine. Clausius deemed the favored direction for conduction to (obviously) be the flow of heat from high to low temperature, and thus the flow of heat in the opposite direction to be disfavored. Whereas the favored directions simply occur as a part of nature’s master plan, the disfavored directions need to be coerced. For example, in order to get work from heat you need a device, like a heat engine; otherwise, it will simply dissipate without the production of work. However, the favored direction, or the one preferred by the universe, where heat is produced from work occurs easily. It happens from any sort of effort as result of friction. Whenever your feet slide across the floor as you walk, or the tires of your car rub against the ground as you drive, or your fingers bang on the keyboard as you type … friction is right there producing heat from your efforts. It’s painfully clear that the favored direction of heat flow is from high to low temperature; it’s why things cool down but never heat up on their own. Moving heat from low to high temperature requires work to be done by a heat pump (as discussed earlier), such as an air conditioner or a refrigerator. Using these concepts and revisiting Carnot’s heat engine, Clausius was able to come to an amazing conclusion. After establishing the mathematical guidelines for his new theory, Clausius calculates what he called the equivalence values: the equivalence value for conduction in the favored direction, and the equivalence value for conversion in the disfavored direction. With a combination of impressive physical intuition and mathematical prowess, he found that if Carnot’s heat engine is run in a cycle, the total of his newly defined equivalence values was … zero! Indeed, this may have been one of the most interesting zeros in physics history. Let me explain. Running Carnot’s engine in a cycle merely corresponds to the physical way a real heat engine – like your car engine – works. At the end of every cycle, the engine returns back to its original state or starting point, ready to begin the whole process again. However, it was the resulting zero in Clausius’ theory that was the big deal. Specifically, it meant that Clausius had found a new physical quantity related to the mechanisms (conversion and conduction) of heat. Not just any old physical quantity, but rather a very special type known as a state function. A state function is special because its value depends only on the present state of the system, rather than how the system acquired the state. A very familiar state function is volume. For example, imagine filling a glass with water to exactly a volume of half full. Now, imagine filling it completely full, but then dumping out just enough water to bring its volume to, once again, half full. Clearly, even though we achieved the volume of half full by two different routes, the end result is the same. Moreover, the value of any state function will be unchanged if the starting and ending states of the system are the same – like they are in a cycle – regardless of the way we get from start to finish. Once again, consider the glass of water. Even though we obtained the volume of half full in two different ways, there wasn’t a difference between the ending volumes; they were exactly the same. In other words: zero. And that’s what Clausius’ zero meant too: some unknown state function related to heat remained unchanged as a result of Carnot’s engine starting and ending in the same state. But what exactly was this state function? And what did it mean physically? In 1854, Clausius identified a new state function by running Carnot’s heat engine in a cycle. Surprisingly enough at this time, he didn’t give it a name, but nonetheless he did define it as the “heat over temperature” for a given process. For example, the process of withdrawing heat from a heat reservoir divided by the temperature of the heat reservoir, or the heat tossed to a cold reservoir divided by the temperature of the cold reservoir. That is: where is the heat, and is the temperature in units of Kelvin. Recall that in Carnot’s (reversible and perfectly idealized) heat engine the only heat lost to the surroundings is that which is tossed to the cold reservoir. This amount of heat is a required lost – there’s simply no way around it – which the universe demands (nature’s compensation) for the luxury of using a heat engine to do work. Nonetheless, Carnot’s heat engine is still the most efficient heat engine there is, and of course we know it only exist on paper; you can’t build Carnot’s perfectly reversible heat engine. So, this means for a reversible process run in a cycle, a given has another that cancels it out, sort of a partner if you will, thus insuring that the total over all of them will be zero. However, for irreversible process, this is not the case at all; each does not have a partner, and the end result is a leftover (or uncompensated transformation, as Clausius called it), which causes the total to be greater than zero; a positive value. Processes in nature are irreversible, and therefore have a leftover here and there, which contributes (by adding that positive value to the total) to an ever-increasing amount of entropy in the universe. A special type of irreversible process is a spontaneous process. A spontaneous process happens without needing any extra help to occur; it proceeds in the favored direction without the input of work. So, processes such as your coffee cooling down (as heat flows from it to the surroundings), a glass breaking upon falling to the ground (once the work of – for example – pushing it to the edge of the counter has been done), ice cubes melting in your drink, and many, many more such spontaneous process all have this positive value. The larger this positive value, the more favored the process, and the more it increases the entropy of the universe. “1. The energy of the universe is constant. 2. The entropy of the universe tends to a maximum”. So, whereas the universe keeps energy at a constant (energy is conserved), it continues to increase the entropy. Therefore, no process that occurs will ever result in an overall decrease in the entropy of the universe. The universes’ tendency of maximizing entropy is reminiscent of “a universal tendency to the dissipation of mechanical energy” as stated by Thomson, and Clausius noted the connection. Indeed, it’s this dissipation – a loss of energy that might have been otherwise used for work – that separates a reversible process from an irreversible one. Evidently this is all part of nature’s master plan to maximize the entropy of the universe, ultimately leading to its heat death. 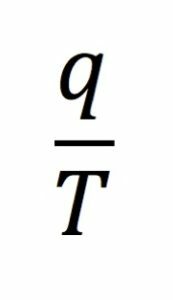 When the entropy of the universe finally reaches its maximum value, where it simply can’t increase the amount of entropy anymore, all that will remain is energy dissipated as heat. This energy will be spread among all the atoms and molecules in the universe. This distribution of energy will be similar to before when we talked about the energy of the ocean (versus that of a river) in that we will have no way to harness it for work. In other words, all the useful energy in the universe will be gone, and all that will remain is useless heat! However, there’s nothing in the definition, thus far, connecting entropy in any way to atoms; there’s no microscopic interpretation. It took the amazing efforts of a few scientists to show that entropy does indeed have a microscopic interpretation, which not only complements the thermodynamic description originated by Clausius, but also extends it dramatically, making the entropy concept an even more powerful tool in modern day science.